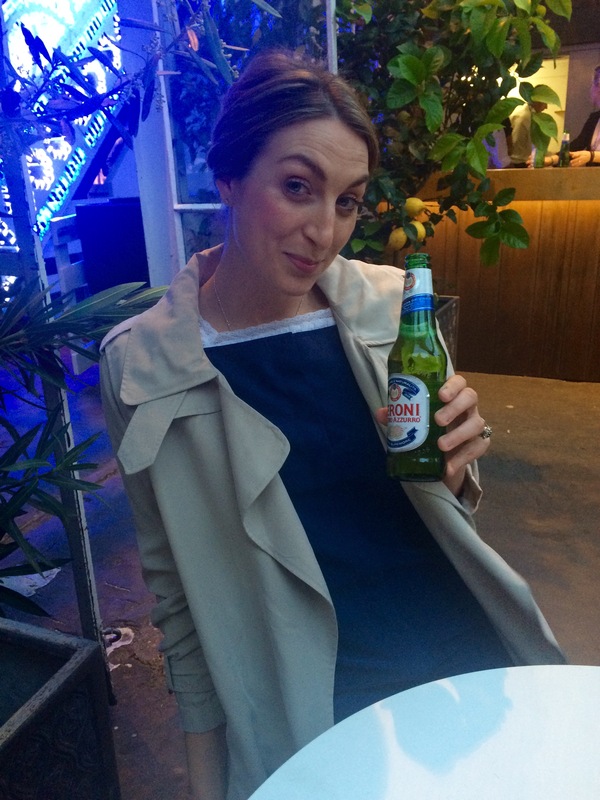 So on Wednesday I was invited to the opening night of The House of Peroni, on Brick Lane, East London. It is an amazing pop up and I recommend popping along. As soon as you walk through the doors you feel like you are in an Italian square. As you walk up the stairs you can look down on the site you are about to enter, beautiful blue lights and dried flowers surround the space, with multiple bars and an outdoor space, there is even a cinema! As you walk down the stairs you are welcomed with a bottle of Peroni, I was given one of these fabulous bottles, which are apparently more feminine, all I was thinking was, what a great vase this would make for a single flower! But for those that aren’t big beer drinkers, there were plenty of cocktails on hand, with smoking cocktails, one with a mini ice cream cone and slushies. Science of Mixology – Making the ordinary extraordinary, this immersive masterclass uncovers the tips and tricks behind molecular mixology. Led by Residency mixologist Simone Caporale, guests will learn how to change liquids to solids, foams and jellies and use them to enliven any classic cocktail. 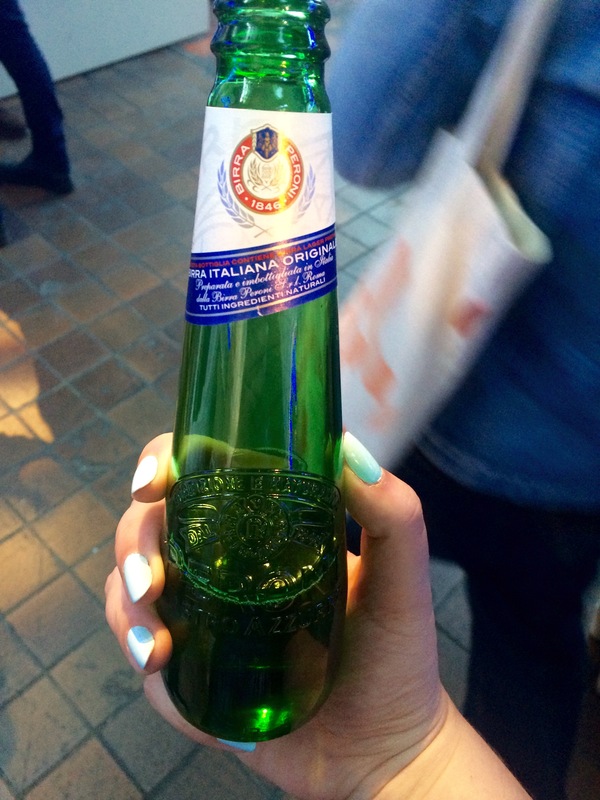 Includes a complimentary Peroni Nastro Azzurro. Sapori Di Sicilia – Experience the tastes and aromas of Sicilian-inspred street food every Friday night, courtesy of the finest modern Italian artisanal traders. With authentic contemporary Italian food inspired by the beatiful region of Sicily, the same inspiration behind The Residency menu, enjoy delicious piadina and other delicacies while enjoying the terrace. And in case eating like a real Italian wasn’t enough, try cooking like one; Michelin-starred Residency chef Accursio Craparo’s hand-selected favourite ingredients used in his very own menus are available to purchase at The Residency’s Strazzanti shop. Culture of Coffee – Coffee is more than a beverage to Italians, and the practice of drinking it more than just a habit. Guests can enhance their experience at the caffè as they learn about the culture of coffee in Italy, and are exposed to a bespoke menu with innovative blends and tastes from coffee partner Caffè Molinari in association with Stella Coffe & Tea. La Dolce Granita – Indulge your taste buds at The House of Peroni’s granita bar. From Florence’s take on the classic dessert – an iris flower and violet creation topped with gin – to an icy saffron syrup hailing from Milan, Residency mixologist Simone Caporale has created a menu inspired by Italy’s greatest cities. This little taste of Italy will be sure to transport you to sunny days by the coast. There is also be a private cinema experience, Cinema All’Aperto, showing iconic Italian films throughout each week which guests can book spaces to online. One of my highlights of the evening was that I got to bump into a couple of very old friends, including the lovely lady below, Laura (always stylish, especially modeling a Peroni) and her hubby Dan.